Pictured clockwise are Erin (Lach) Hertz, Jen (Zahn) and Mike Arlien, Andrea (Limke) Hedberg and Liz (Ellis) Slotsve. For questions, contact McKechnie at janna.mckechnie@minotstateu.edu or 858-3234. Strengthen ND and Minot State University’s Center for Extended Learning partnered to establish the Nonprofit Certificate Program to meet the capacity-building needs of nonprofit professionals and volunteers. Strengthen ND and Minot State will leverage the expertise of area professionals to facilitate program sessions featuring topics of nonprofit management, including board governance, finance ethics, human resources, grant seeking and grant-proposal writing, marketing and public relations, fundraising and strategic and action planning. The Nonprofit Certificate Program will meet monthly from 8 a.m. to noon for six months beginning Oct. 5. The cost is $300 per person, which includes all materials. To register, individuals can contact Megan Laudenschlager at (701)303-0840 or megan@strengthennd.com. To learn more about Strengthen ND and the program, go to www.StrengthenND.com. 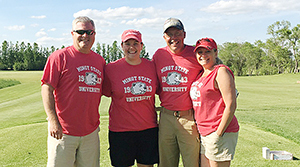 Only one stop remains on Minot State University’s 11th annual Friend-raising Golf Tour. The tour ends Aug. 4 in Kenmare. The format is a four-person, 9-hole scramble. Registration begins at 4:30 p.m., with a shotgun start at 5 p.m. A social immediately follows completion of golf. Non-golfers are welcome to attend. MSU will recognize area students receiving 2016-17 scholarships at the social. Prizes and T-shirts will be awarded. The Friend-raising Golf Tour is sponsored by Alumni Association, Advancement Office, Athletic Department and the Marketing Office. Call the MSU Advancement Office with questions or to register at 858-3234 or 701-800-777-0750, ext. 3234, or visit the website, www.minotstateu.edu/alumni. 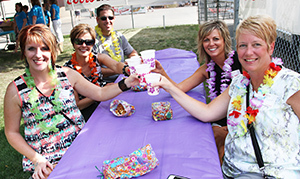 Pictured, left to right, are Dave Kramer, Jennifer Miller and Johnny and D’Ann Johnson. 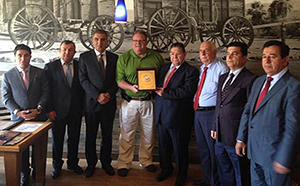 The Minot Area Council for International Visitors crafted regional programming June 27-28 for seven Kurdish representatives of Chambers of Commerce. They visited regional locations, including Stanley, the Fort Berthold Indian Reservation, North Dakota Port Services and AGT Foods. This was part of a larger United States program administered by Meridian International Center in which they met with American counterparts, business groups and local government officials in American oil and gas-producing cities to examine how communities grow the private sector, diversify the economy and handle the boom-and-bust cycles of economic growth. Under the auspices of the Department of State’s International Visitor Leadership Program, current and emerging foreign leaders learn about the U.S. firsthand and cultivate lasting relationships with their American counterparts. Professional meetings reflect the participants’ professional interests and support U.S. foreign policy goals. In the photo, John MacMartin, Minot Area Chamber of Commerce president, received a plaque from the visitors. A nonprofit, community and university-based organization, MACIV has been headquartered at Minot State University since 1992. It designs professional programs and provides cultural activities and home-hospitality opportunities for foreign leaders, specialists and international scholars. For questions, contact Joseph Jastrzembski, MSU history professor and MACIV president, at joseph.jastrzembski@minotstateu.edu. Minot State University welcomes new employees, Annette Clark, Jill Hambek and Jane Kelly. Clark is a POWER Center academic coach. Previously, she worked at Minot Public Schools. She holds a bachelor’s degree in sociology from the University of Georgia, Athens. She and her husband, Michael, have a dog, George. Hambek, Gordon B. Olson Library access services associate, previously wrote for the Minot Daily News. She completed a bachelor’s degree in English from MSU. When not telling people to “shush” in the library, she runs, does CrossFit, clog dances, reads, writes, colors and watches TV. Kelly, a POWER Center academic coach, is returning “home” to Minot State. She was a recruiter in the Office of Enrollment Services in the late ’80s and early ’90s. A Kentucky native, she possesses a bachelor’s degree in English from Vanderbilt University, Nashville. Previously, she worked at Minot Public Schools. She loves learning, laughing and serving and looks forward to coaching and advising POWER students. Her husband, Stewart, teaches philosophy at MSU, and the couple have two daughters. July 20-Aug. 10 — “Modern Venus,” mixed media, sculpture and photography by Wendy Kimble, MSU adjunct are professor, Library Gallery. July 22-Aug. 12 — “Hollow Innocence,” ceramic vessels by Emilie Marquardt, MSU alumna, Hartnett Gallery. A public reception for “Hollow Innocence” will be Friday (July 22) in the Hartnett Gallery from 5 to 7 p.m.
Linda Benson, public information specialist, judged three categories, floral arrangements, glue solutions, and scrapbooking, at Ward County 4-H Achievement Days June 21. Guy Hanley, assistant professor of science, and curator of collections, had his image of the scarab beetle species Coenonycha globosa featured on the back cover of the June Coleopterists Bulletin, the international journal of the Coleopterists Society. Leisa Harmon, assistant professor of communication disorders, was selected to be a graduate program accreditation site visitor for the Council on Academic Accreditation of the American Speech-Language-Hearing Association. She participated in site visitor training June 26-28 at the ASHA national office in Rockville, Md. Nicole Thom-Arens, English instructor, received her Master of Fine Arts in writing from Lindenwood University in May 2016.